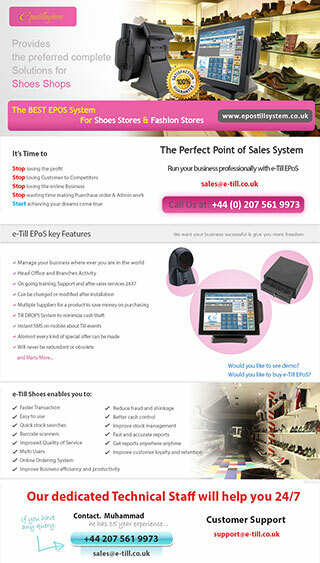 EPOS Shoes System is a leading provider of retail store technology amongst footwear retailers across UK. We have customized our software to deliver specific needs of this industry by including out-of-the-box features such as three dimensional grids, robust customer loyalty programs, the ability to view history from any time, unlimited barcodes and more. Contact us today to see why CounterPoint is the perfect fit for thousands of retailers. Counter Point includes a robust inventory management system, touchscreen point of sale (POS) ticket entry, built-in customer loyalty programs, automated purchasing and impressive reporting capabilities. Instant inventory updates let you know what's in stock, on order, and in transit. Track your customers, control your purchasing, retain detailed sales history, or open an online store-CounterPoint includes everything you need to streamline your business and boost your bottom line. CounterPoint has all the features you need to efficiently and effectively operate your business at its fullest potential. Manage Your Business where ever you are in the world. Suitable for Single Terminal & Multi Terminal. Almost Every kind of Special Offer can be made. 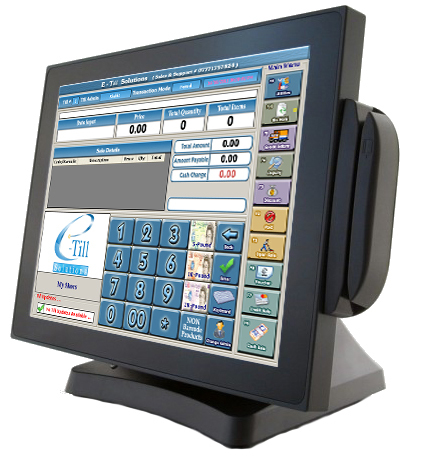 Hand-Held Terminal Support for Stock Take & Delivery. Cash & Credit Card Mix Payment Option With Direct Credit Card Machine Integration. Product Enquiry with Price, Stock & Location. Till DROPS System to Minimize Cash Theft. Fast and Easy to learn and use. Instant Updates are applied to the Whole System. Product Enquiry System With Send Product Test Request To Store. Product Sticky Labels Printing System to Put Barcoded Labels on Non Barcode Products. Till Discount (Can be given on each product, Can be managed (Percentage, Amount). Good Return with Cash / Credit Card / Voucher. Separate Reading of Cash Drawer & PDQ Machine to Instantly find Till Shortage. Z-Reading with Cash, Credit Card & Voucher Details. Open Sale can be Disabled, Enabled or Password Protected to stop illegal sale by Till Admins. Customer Product Requests can be saved by Till. Till Float can be defined from Back Office. Product's Store & Shelf Stock can be managed. Paper Less Office System to manage business documents which can be accessed from any where in world. Instant SMS Messages on Z-Reading, Message from Cashier to Admin & Till Paid Outs.